As part of the company's 125th Anniversary celebration, Victorinox reissued this classic version of its first Soldier knife. 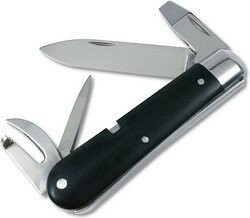 Manufactured for the Swiss Army beginning in 1891, the Soldier knife was the first multi-purpose pocket knife developed in Switzerland. Its assortment of practical blades outfitted the modern infantryman of the day with a convenient and durable miniature toolkit. Today, you'd be hard pressed to find a knife like the Soldier anywhere but on a collector's shelf, since all tools were built for the challenges of the 18th century. The strong reamer was meant for repairs on horse's harnesses, and the flat screwdriver blade fit breakdown screws on Swiss Army rifles. The style of the can opener blade obviously was built to handle something much tougher than modern food tins. The spear point knife blade is the only thing that hasn't changed much. The Heritage uses the same styling as the original Soldier, including handle slabs of polished African ebony hardwood. All blades, however, are made from modern high carbon stainless steel. Victorinox produced only 1,884 of these Heritage knives. Each one ships in a handsome black hardwood presentation case. The cover of the case is inlaid with a metal replica of the Victorinox emblem, the cross and shield. Four inches long when closed, the Swiss Army Heritage carries the same lifetime warranty as other versions of the still-famous Swiss Army Knife. The 125th Anniversary Heritage is just like the old Soldier, except that modern materials and methods make it better. Collectors of fine limited edition knives will also find the Lamborghini Extrema Ratio Reventon Folder of interest.